Despite piling on more debt, the video streamer claims its borrowing is conservative. Streaming giant Netflix (NASDAQ:NFLX) is burning through billions of dollars each year as it aggressively expands its portfolio of original content. That spending is being fueled by junk debt, and lots of it. After issuing a fresh $2 billion worth of high-yield debt in October, the company's total debt load has surpassed $10 billion. This debt isn't a problem, at least according to Netflix. The company has often trotted out the concept of an "equity cushion" to argue that its borrowing is nothing to worry about. You see, Netflix's stock price is high. Really high. The company is valued at about $110 billion, putting the ratio of total debt to market capitalization at less than 10%. This ratio is low compared to that of many other media companies, so Netflix argues that its borrowing is actually conservative. There's just a tiny little flaw in Netflix's logic: It doesn't make any sense at all. Netflix's argument relies on the idea that the company would be able to sell additional shares to deal with its debt if it needed to, thus taking advantage of its "equity cushion." But if the company ever reaches the point at which it needs to sell shares, that "equity cushion" would have probably already vanished. Netflix has such a high stock price, equivalent to nearly 100 times trailing-12-month earnings, because investors are optimistic. But that optimism has faded quite a bit over the past few months. Shares of Netflix have lost about 38% of their value since peaking in July, the result of a stock market correction that could turn into a full-fledged bear market. Netflix's "equity cushion" has deflated by nearly 40%, despite the company's high-octane revenue growth. Netflix added far more subscribers than expected during the third quarter, giving investors little reason to become less optimistic. Just imagine what would happen to the "equity cushion" if Netflix started missing expectations. The bottom line: Netflix's gargantuan "equity cushion" will only exist when times are good. A high stock price today provides no safety at all tomorrow. If it ever becomes infeasible or overly expensive to refinance its debt -- say during a recession-driven credit crunch -- the optimism that currently props up Netflix's stock price will likely be long gone. Netflix's debt-to-capital ratio, a number derived solely from the balance sheet, has ballooned. This ratio sat at 62% at the end of the third quarter, prior to the issuance of $2 billion of additional debt. It's more than doubled since 2014. 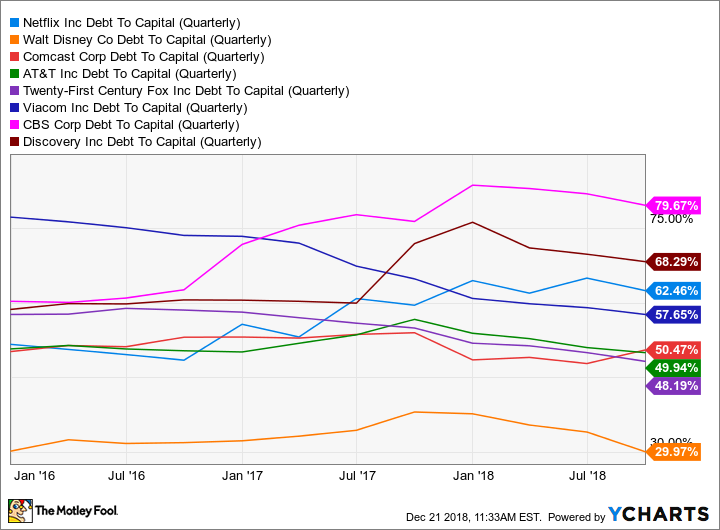 NFLX Debt To Capital (Quarterly) data by YCharts. With Netflix expecting to burn through between $3 billion and $4 billion of free cash flow both this year and next year, the company's debt is only going to rise for the foreseeable future. With cash flow so deeply negative and debt levels so high, Netflix is highly susceptible to any sort of shock. Other media companies have ample free cash flow backing their borrowing. Netflix does not, and it's unclear how much the company can dial back its content spending before it starts losing customers. If Netflix is forced to pull back on growth investments, can you guess what would happen to the high-flying stock? Excessive debt makes companies fragile, and that fragility only becomes apparent when the good times end. Instead of hoping for the best but planning for the worst, Netflix's strategy seems to start and end with hoping for the best. It all may work out for the debt-ridden streamer in the end, but that's a risky bet for investors to make.